The Chief Executive of the Hong Kong Special Administrative Region (HKSAR), Leung Chun-ying, struck a ceremonial gong to signal the start of the 35th Asian Racing Conference (ARC) during a stunning opening ceremony and gala dinner at the Hong Kong Convention and Exhibition Centre tonight. Mr T. Brian Stevenson, Chairman of the Hong Kong Jockey Club, delivers a welcome speech at the 35th Asian Racing Conference opening ceremony. 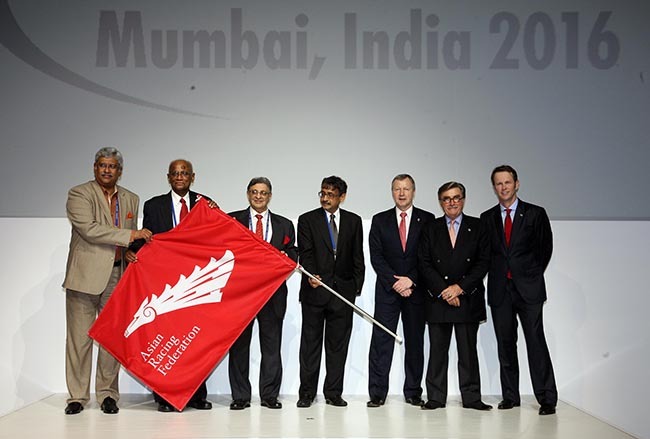 The regional flag of the Hong Kong Special Administrative Region hung proudly alongside those of the Asian Racing Federation’s member nations and regions as Hong Kong Jockey Club Chairman Mr T Brian Stevenson welcomed a record number of almost 800 delegates, as well as media and invited guests, gathered from around the globe. The guests included Mr Louis Romanet, Chairman of the International Federation of Horseracing Authorities and Mr Ingmar de Vos, Secretary General of the International Equestrian Federation. Mr Stevenson spoke of Hong Kong’s “amazing vibrancy and blend of cultures” as he addressed those present ahead of what is the world’s largest and most significant horseracing industry conference. “Horse racing is one of Hong Kong’s world-class brands but equally importantly its method of operation and structure is by way of a unique model of social innovation which benefits the entire Hong Kong community through the Jockey Club’s not-for-profit business model,” he said. Dr Koji Sato, Chairman of the Asian Racing Federation (ARF), congratulated the Hong Kong Jockey Club on its 130th Anniversary during his opening remarks. The Hong Kong community was well-represented during the evening as those assembled enjoyed harmonies from a local children’s community choir, an energetic, flag-waving representation from Shaolin Kung Fu and a performance by musicians from the HKJC Scholarship Scheme. 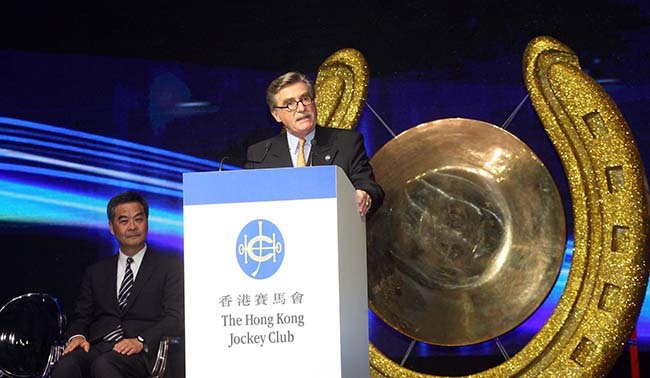 “We are particularly honoured that this is the third time that Hong Kong has been chosen as the host city for the Asian Racing Conference, the last occasion being 1991,” said Mr Stevenson, who outlined the massive growth in Asian horseracing over the past 20 years and the rise to preeminence of the ARC. “The ARC is now the largest racing conference in the world and is no longer just a regional gathering but is now one of the major forums and marketplaces for ideas for the racing industry worldwide,” he said. “This year's 35th event has drawn a record attendance of almost 800 racing officials, administrators, executives and leaders in various business fields from some 40 jurisdictions, all motivated to embrace a common global vision for the development of this great sport. “The ARC is a global forum for industry leaders from around the world to meet together, identify emerging issues, and to develop new strategies,” said Dr Sato. The three-day conference at the Convention and Exhibition Centre will consist of 15 seminars, featuring topics such as the future landscape for wagering, the use of cutting edge technology in sports broadcasting, the issue of drug control, the community impact of racecourses, and the international movement of elite horses.